We have completed the first and second books of this heavenly star revelation. We have seen The Redeemer in His first coming in Book One. We have seen The Redeemed (the church) being blessed while they are absent of their Redeemer in Book Two. And in seeing these, we have seen the fulfillment of the original Seed-Prophecy (see Scorpio) given by God Himself that a Messiah would come to redeem mankind from the penalty of sin. This prophecy was just a hint of a plan already conceived “before the foundation of the world.” Ultimately, the plan was shown to be, in essence, a gift from Him to us. Book One showed us how that prophecy (promise!) came to be fulfilled by the incarnation (God becoming flesh) of the second person of the Godhead. He became a baby in Bethlehem. He became a man unequaled in wisdom and power, capable of a public ministry to the suffering and inner needs of mankind that, without argument, has literally turned the world around. The pivotal point of ALL of history was our Redeemer’s first coming. Book Two presented our (the Church, meaning the body of believers between His crucifixion and His second return) position in Christ now that He has done so much for us. We have the unspeakable privilege of UNION with Christ, authority from Him, and a heavenly citizenship in His eternal home. Book Two ended with our Lord’s return before the coming tribulation. He will come at that time FOR His church, snatching her away to be with Him forever. That event will mark the end of the Church Age and will usher in the Age of His Kingdom — which is the subject of Book Three that begins her with Taurus. In Book Three we will see the ultimate fulfillment of all Biblical promises because we will see His kingdom established on earth. This kingdom will endure for 1000 years during which time there will be peace and harmony between all of the components of His creation. It will be a time of the irrevocable rule of righteousness. A time when He will rule with “a rod of iron.” It will also be a time when the whole earth will reflect His standards of beauty in its outward appearances. The planet will be a perfect paradise! This is the exciting theme of the next sixteen star signs, including this one — Taurus. In Greek mythology, the story goes that Jupiter loved Europa so much that he decided to change into the form of a bull just to get close to her. She was attracted to him, first stroking his coat and then seating herself on his back. He then sprang away with her back to his home where he revealed himself and won her love. This myth is the most astounding instance of hidden truth to found in the whole star study, for here is the second part to the Return of Christ. 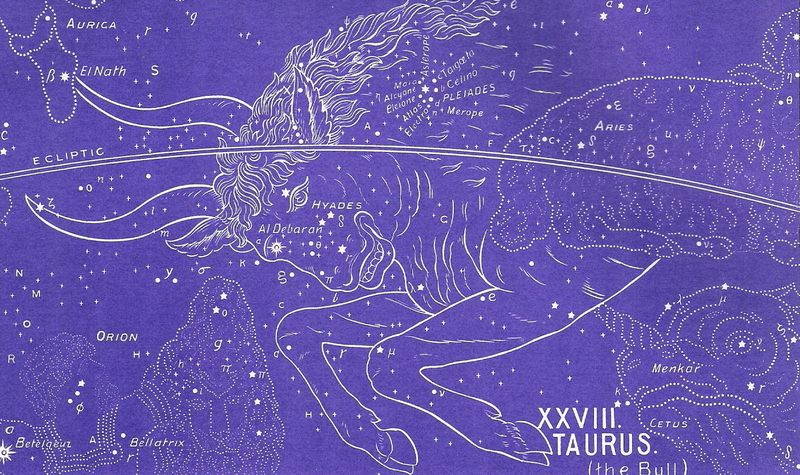 Notice that Taurus seems to share a body with (or spring out of the body) Aries, the Lamb. This signifies that the return of Jesus Christ will come in two parts. Aries represents the first part, when Jesus returns in the air and snatches His Bride (the Church) away to her eternal home. Taurus represents when Jesus returns AGAIN — this time to set up His earthly kingdom. The Church also returns with Christ to reign with Him. Here is a bull with two horns (represents the two tribes of Joseph finding their fulfillment in Christ.) The Pleiades are located in the bull’s shoulder, close to his heart. The Hyades are located a little below the Pleiades. The Pleiadesis unquestionably a picture of the Church. Remember also that Taurus is stomping on the head of Cetus, the sea monster that represents evil in its entirety. The great Gospel message has a past tense (we have been saved from sin’s penalty), a present tense (we are being saved presently from sin’s power over us), and a future tense (we will be saved from the presence of sin). This is the beginning Book Three of our star revelation which deals with the promise of the future deliverance of the church — the Second Coming of Jesus Christ. To continue in the correct order of the ancient star chart, please select Orion next. And be sure to download your copy of the Free e-book that discusses the historical, cultural, and biblical evidences for this amazing star revelation.